The Senkaku Islands are a cluster of Islands in the South China Sea. Recently, an incident between a Chinese fishing boat and the Japanese Coast Guard have escalated to more than fishing. Both countries have used this incident as a springboard the the much older and deeper waters of land and drilling rights of the Senkaku Islands. The Chinese call them the Diayou Islands and claim some 200 year old maps clearly indicate the islands belong to China. Etc etc… now the Eastern superpowers are protesting, fighting and squabbling over natural gas rights. My inspiration for today’s Cartoon of the Day was the history behind this disagreement. So what could be better than fanning the flames of the ages old debate of who would win a fight between PIRATES VS NINJAS? 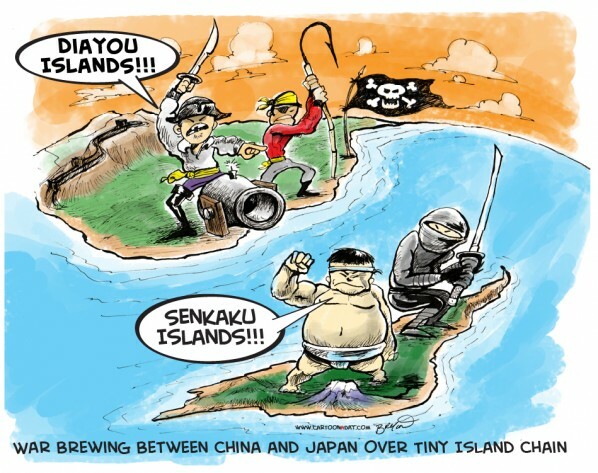 China Pirates are at war with Cartoon Japanese Ninjas and Sumo wrestlers. THe cartoon fighters dominate their countries.